The Shiraz and Viognier grapes were crushed and co-fermented. Malolactic fermentation took place in barrel. The wine was matured for 21 months in 24% new 225L barrels (95% French, 5% American oak). This ruby colored, vibrant wine entices with an explosive mix of violets, mint, thyme and white pepper. The entry is juicy and bright leading to a fresh palate that combines flavours of mulberries, mint and cream. Rich, lingering fruit; elegant, integrated tannins and firm fresh acidity. 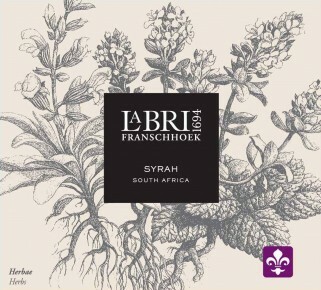 Each wine is linked to a specific flower– the characteristics of the wine are symbolized by that particular flower on the label: the Syrah is represented by Herbs (or Herbae) because of its powerful perfumed aromas of fennel, thyme, rosemary, violet and oregano, much like on would experience whilst strolling through a herb garden. The components are picked together during the first week of March. Crushed and co-fermetend. Malolactic takes place in barrel.